Last blog of the summer! It is hard to believe that 10 weeks has gone by so quickly and that our internships have ended. The final few weeks were not only busy with finishing up the projects, but also full of new, fun experiences. 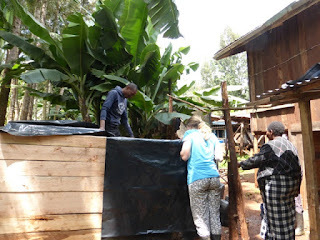 I (Maggie) also had a chance to visit the Meru side of Mount Kenya and help with the Farmers Helping Farmers (FHF) project that has been started there. As Mira and Sarifa have previously mentioned, it was really interesting to see the differences in the management styles of cattle in this area, as well as such a new and rapidly growing dairy with such a promising future. Some of the major differences I noticed were that most farmers have larger herds of cattle, graze their cattle, and use more natural breeding as opposed to artificial insemination (AI). These different management practices resulted in different health implications; the tendencies I noticed were that the grazed cattle were in better body condition, but had considerable number of ticks, and I even saw one that had severe skin cancer from sun exposure. While there, I also had the opportunity to spend an afternoon with the two Atlantic Veterinary College students (Emily and Krista) at the Mother Maria Zanelli Children’s Home, which is run by the Sisters of St. Theresa’s. I was extremely impressed with the facilities and the staff, and we had a lot of fun helping out with meals and playing with the children…they were very excited to learn “Red light, green light” and “Hot potato”! 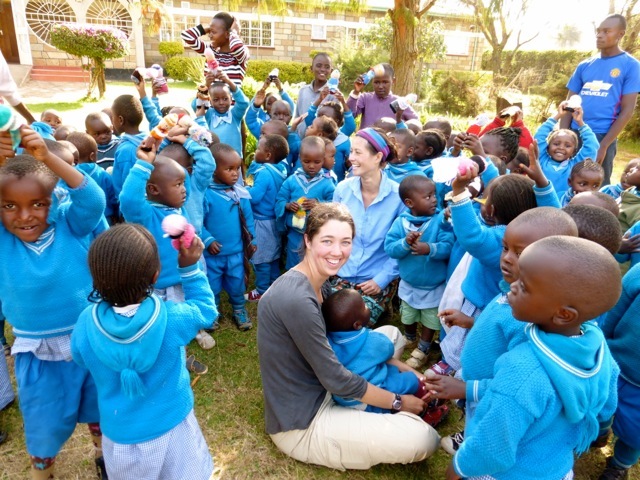 Photo 1: Maggie (back) and Emily (front) with a group of children showing off their “Hot potatoes” (donated homemade dolls from PEI) at the Children’s home in Meru. When I returned to Mukurwe-ini, Emily came with me. It was a great week for her to visit, as we continued working on farms from the nutrition project, while also having the chance to accompany a local veterinary technician on his calls. 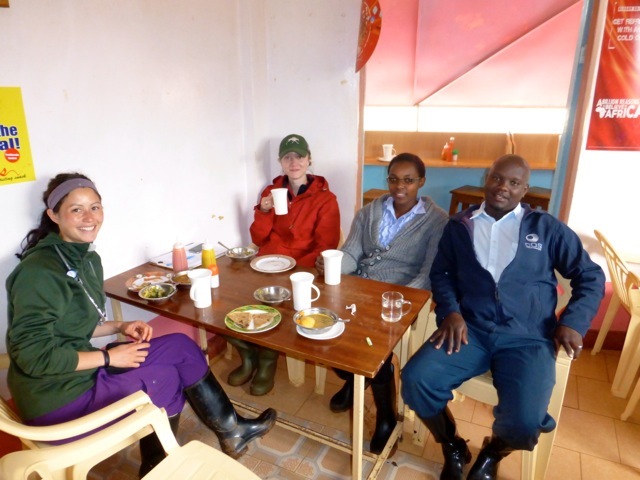 The Wakulima Dairy has one veterinarian and four technicians whose services are available to members; it is a great system in which farmers can use their credits to pay for these services. Patrick is one of these technicians, and was kind enough to let two students (per day) accompany him for a couple of days. It was very interesting for us to see how veterinary services work in this area; in general, the veterinarian is usually called to challenging cases, and the technicians are called to treat the more common problems and to do AI, which is the primary method of breeding in this region. Despite being extremely busy (visiting 10-15 farms/day), Patrick was an amazingly patient and informative teacher and we learned so much in such a short period! Photo 2: Maggie helping treat a cow for metritis (infected uterus) following calving. 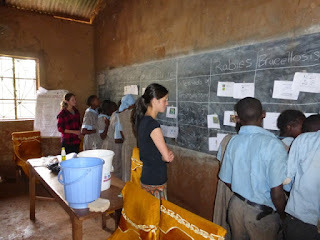 That week, we also taught at our last primary school. Once again, I was blown away by the attentiveness and enthusiasm of the pupils and the questions that some of them had, which demonstrated some impressive critical thinking. 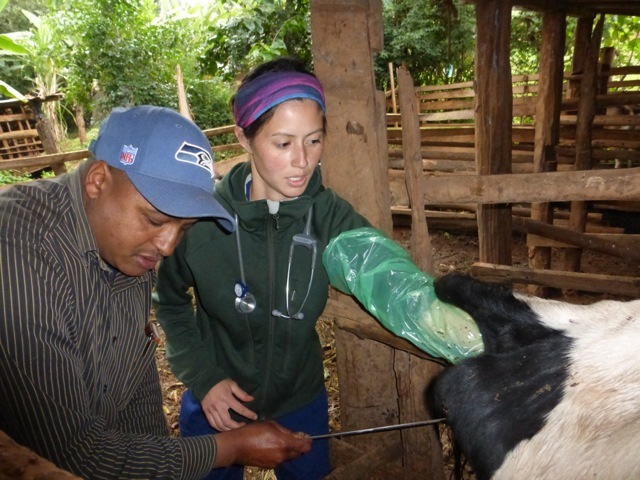 As veterinary students, these teaching experiences have been invaluable to us. Not only have we been able to share knowledge that we are well versed in and that we believe is important in the daily lives of these children, but we have also been able to strengthen our communication skills while being inspired by the motivation and studiousness of these children. At the end of the lesson, we were actually told an unfortunate story of a women in the area who died of rabies only a few years ago; this tragedy really reinforced the fact that the diseases we taught about are very relevant and of real concern. 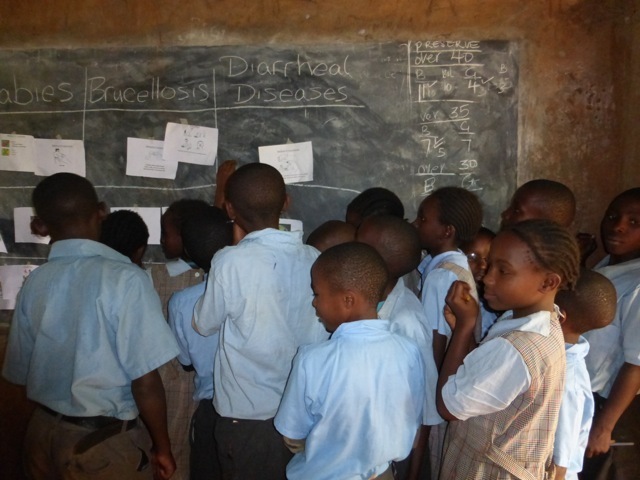 Photos 3 and 4: Students at Mweru Primary School going over the review activity on zoonotic diseases. After teaching, we had the opportunity to spend the night billeting with some local farmers. Both Joyce and Esther are directors at the Dairy and were gracious enough to host two students each in their homes. It was a really enjoyable time full of cooking, meeting friends and neighbours, and engaging conversations! We also toured their farms, checked their cows for mastitis, and discussed some ideas for changing stalls to improve cow comfort. 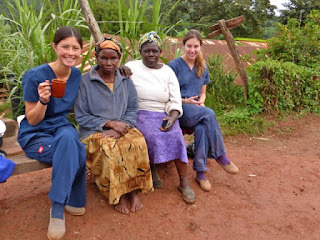 Photo 6: Maggie and Mira have morning chai (tea) with Esther (right) and her friend Mary (left). 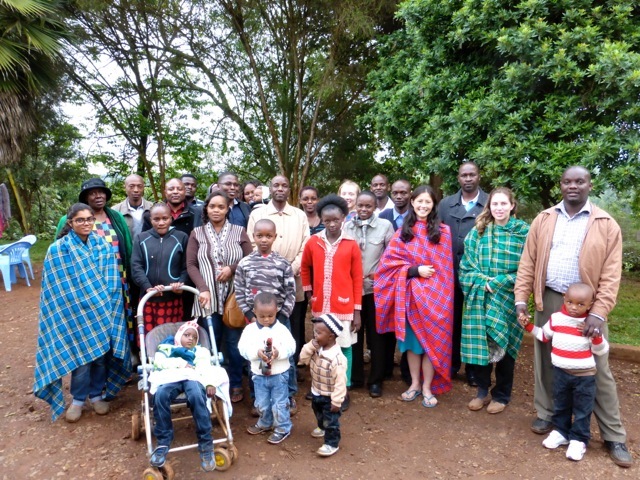 At the end of the week, we also had a chance to visit the University of Nairobi Veterinary School. We had a great tour of the facilities, and even got to try some yogurt made by the Department of Food Science that shares the campus. The campus was fairly quiet, as the veterinary students are out on 2-month rotations around the country; in Kenya, this is part of the curriculum for all students in second to fifth year. Last week marked our final week of work, but we were fortunate to continue having new opportunities! The Dairy has several extension officers whose roles are working with and educating farmers in different topics. On Tuesday, Sarifa and I attended a training session that Elias, one of the officers, was holding for a new group of farmers. Farmers can come together and form a group (this one had 10) that can then request free training on subjects of their choice. This particular day, the topics were on cow comfort and calf nutrition, and we were excited (but a little surprised!) to get to teach the portion on cow comfort. 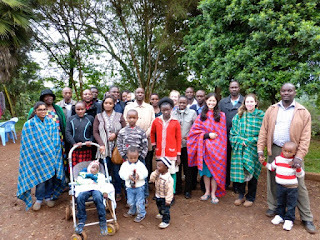 The following day, Mira and I accompanied Elias to several farms to see some silage making. In the past year, the Dairy has invested in several new chaff cutters that are available (free of charge) for members to borrow to make silage. In addition, when a cutter is borrowed, an extension officer also comes and helps/teaches the farmer the entire day that they are making the silage! This investment certainly seems to be paying off, in the past year, the number of farmers making silage has gone from 40 to over 200! This is very exciting as it means more reliable feed sources during dry periods, which translates into increased milk production and increased profits. It was really interesting to see the process on different farms, since each farmer has to work with what they have available and what they can afford. We saw a wide range of storage methods, from 200 kg bags to 1 tonne plastic-lined crates, to 2 tonne pits! 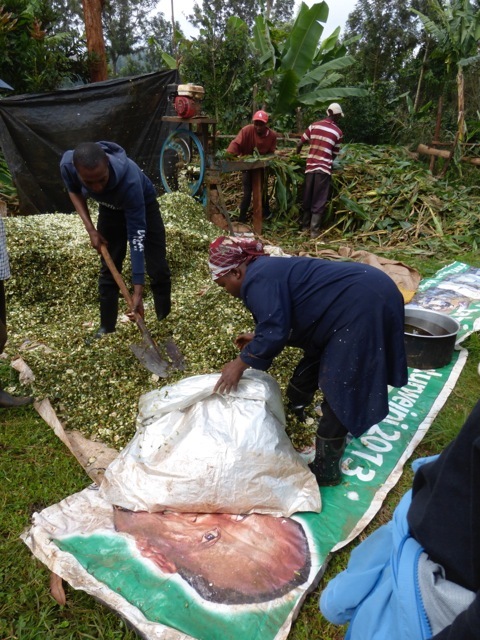 Photo 7: Elias (left) and Susan (right) packing maize silage into a bag that will fit 200 kg. Photo 8: Mira checking out one of the crates that Elias is packing approximately 1 tonne of silage into. Seeing Elias and the other Wakulima Dairy extension officers at work these two days and learning about all the services they provide to farmers was really impressive and inspiring. It was very evident that they really care about their jobs and that farmers are benefiting from their help. On Thursday, Mira and Sarifa had the opportunity to accompany Patrick on calls again, while Shauna and I visited the final farms of the nutrition project. These last visits brought the number of farms I had been to up to nearly 150 and yet, I continued to be moved by the eagerness and generosity of the farmers. In fact, while not surprising, it was definitely a nice treat to finish off the visits being invited into one last farmer’s home for chai and food! Photo 9: Enjoying some chai and lunch at Supa Café, our favourite spot in town. 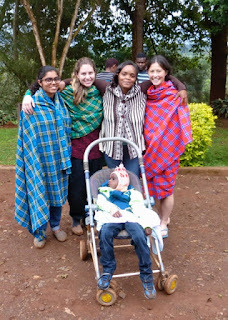 From left to right: Maggie, Shauna, Priscilla, Jeremiah. Friday was my final day in Mukurwe-ini, and it was definitely a great end to an amazing summer! The morning was spent helping our chef Samuel prepare a huge spread of Kenyan food including chapatis, Mukimo (potatoes, greens, and maize), beef stew, chicken, and stir-fried vegetables. That afternoon, we had a party to thank all the incredible people (and their families) that we have been fortunate to work with this summer. The party extended well into the evening, and was a blast of delicious food, heartfelt speeches and thank you’s, and bittersweet goodbyes. It was really nice to have a chance to express our gratitude to everyone, including (but not limited to) our awesome drivers, talented chef, skilled translator, incredible laundress, and all the wonderful employees of the Dairy. 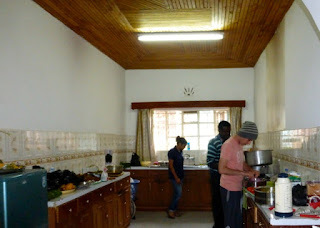 Photo 10: Sarifa, Samuel, and Matthew (Shauna’s husband) working hard preparing food for the thank you party. 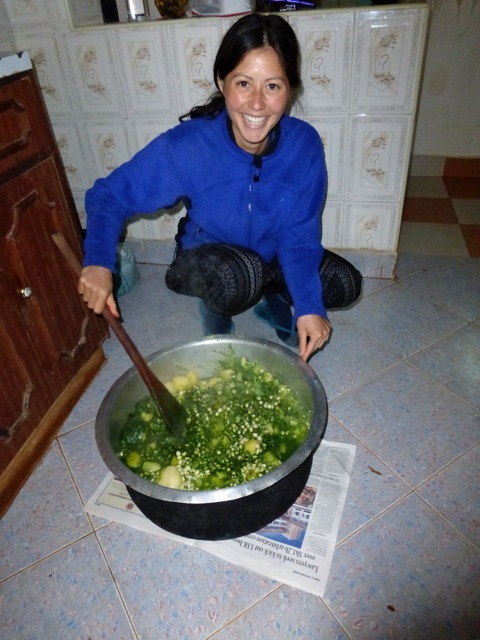 Photo 11: Maggie making mukimo for the thank you party. This summer was truly a once in a lifetime experience. I began the internship with the hopes of helping farmers improve their milk production and maybe learning and improving a few skills myself, but in the end, got so much more. As student interns, we did get to share the knowledge we have from our schooling, and were extremely fortunate to actually see some nearly instantaneous results; extension officers told us that one farmer went from getting 8L to 15L of milk/day solely as a result of the stall changes we made to improve cow comfort. However, I had no idea this experience would be such an exchange of knowledge; for everything that we taught, there is no doubt in my mind that we received 10-fold back in return. 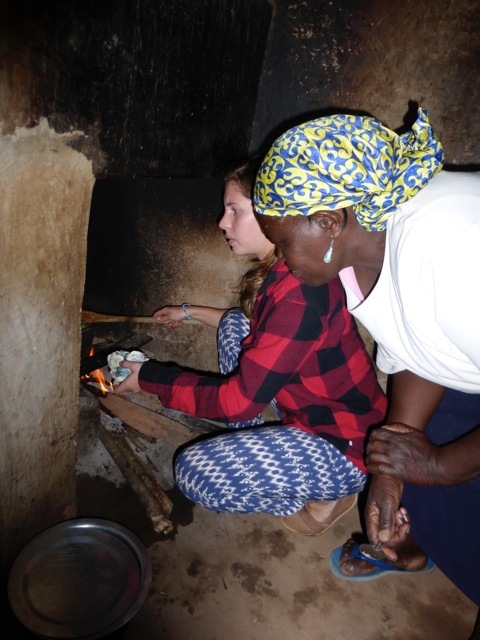 In the past 10 weeks, I have learned more than I could have imagined about veterinary medicine, farming, teamwork, communication, Kenyan culture, and being resourceful, generous, and appreciative for all the wonderful people and things in my life. On behalf of Mira, Sarifa, and myself, I would like to offer my sincere thanks to all those that made this unique opportunity possible, including all those who donated time or money to our fundraising, Veterinarians Without Borders and all their sponsors, Farmers Helping Farmers, and all the wonderful people we were privileged to work with in Mukurwe-ini! 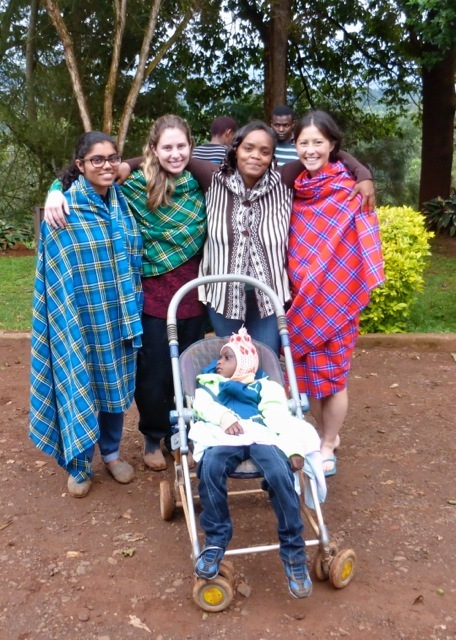 Photo 13: The 3 student interns with our amazing laundress and friend, Ruth and her son Cedric.